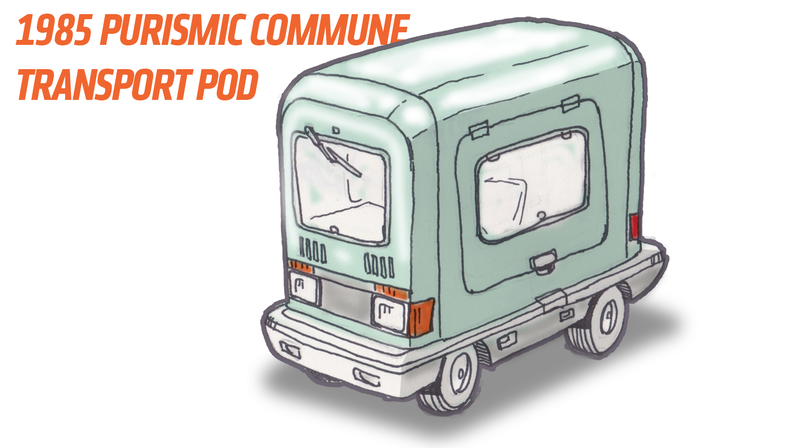 It’s time again for another imaginary car from an imaginary country, and today we’re going on a strange journey to the only absolutely, purely communist sovereign state in the entire imaginary world: the People’s Purismic Commune (PPC). In the PPC, everyone is absolutely equal, and as such there’s only one car for everybody: the incredibly modular Transport Pod. This car is the essence of PPC philosophy, rendered in automotive form. A bit of history and context about the PPC will help understand the Transport Pod. The PPC is based on the ideas of Le Corbusier, the Swiss architect, and early, pre-Marxist communist ideals. Le Corbusier advocated a concept of living called Purism, which envisioned a highly mechanized, utopian society that was extremely regimented and egalitarian. Along with Purism was the fiercely communal ideals of commune living, where there was effectively no personal property, no currency, and everything accomplished via central planning. The city-state/commune was founded in 1930, mostly by ex-Soviets disgusted with the direction the Soviet Union was taking, along with a good number of wealthy American intellectuals and utopian experimenters, who brought with them a wide variety of views, including strange dietary codes and a very open policy of free love. In keeping with their LeCorbusian ideals, many complex negotiations and expensive land purchases were made to secure a perfectly square 400 square-mile parcel of land in South America, between Peru, Brazil, and Colombia. A large wall was erected around the commune, to keep out “decadent influences” and to help maintain the purity of their utopian experience. Though almost everyone assumed the commune would go bust in a matter of months, somehow they persisted, through difficult economic hardship and severe growing pains. A unique culture of smug self-satisfaction soon developed, and it was the stubbornness borne from this culture that is often credited with the commune’s eventual success: the (by now over 4 million) people of the commune could simply not envision a fate worse than admitting they were wrong. By the 1950s, the economy had stabilized, with thriving, well-organized industries helping to bring in outside resources, which were then distributed, commune style, internally. Relations with the outside world were always strained, with the Purism Communards considering the Soviets bumbling communist wanna-bes and the west a pack of greedy buffons. Tourism was always booming to the commune, as a result of simple curiosity and the commune’s shockingly open free-love mores. By the 1970s, two major events happened: Purismic culture gave the world the phrase and concept “I don’t own a television,” and the PPC’s motor industry was mature enough to develop their own car. And boy, was it their own car: the Transport Pod. The idea of some over-styled, over-powered, status-flaunting Western car was anathema to them. Instead, they developed a highly modular motor transport system that would be used by everyone, equally. Everyone over the age of 18 was issued a Transport Pod, all the same pale green color. The pods were narrow and tall, a bit over half the width of a conventional full-sized car, and could sit two on its bench seat. Power was provided by an 1100cc inline-triple (adapted from old DKW two-stroke engine tooling, now made to be four-stroke) making about 48 horsepower, and driving a DAF-licensed (via Volvo) CVT transmission that, for reasons that will become clear soon, allowed for full speeds in reverse as well as forward. The body had two large flip-up doors and a rear hatch with a plastic, roll-up ‘door.’ All three of these body openings were designed with a rubberized accordian-boot ‘tunnel’ that allowed for pods to ‘dock’ with one another, side-to-side ports, or rear port-to-rear. Anchors in the bumper assemblies carried most of the docked vehicle stresses. This allowed the small Pods to link side-to-side to become one larger family-sized Pod-vehicle (the term ‘family’ was almost never used, the PPC preferring the more flexible ‘domestic-unit’) or connected back-to-back to form a long vehicle. In this configuration, the rear vehicle would run in reverse, controlled by the front, and a slide-up red plastic panel would tint the headlights red for use as taillights. For cargo and trucking use, gangs of four were docked side-to-side and back-to-back to make nearly 200 HP ‘tractor units,’ which could pull standard trucking trailers, with an option for more units to be added at the rear. The Pod system sought to provide all transport needs with one basic Pod. Anyone’s Pod could be called into any sort of service at any time, and people, while having a right to a Pod, were not supposed to try to keep the same pod. Of course, there were plenty of people who would surreptitiously ‘mark’ specific Pods they grew attached to, and would seek to get those back whenever possible. Underground groups would sometimes secretly modify and hop-up their Pods, and their were reports of a thriving underground Pod-racing circuit that PPC rule-enforcement councils would frequently pretend not to notice. Incredibly to Western observers, the Transport Pods were a huge success, most likely due to the complete lack of competition and a literally captive population. Ever since the PPC initiated its ‘Total Blackout’ policy in 1992 and installed the largest roof ever constructed over its commune, information about the car’s progress is pretty unknown, as is everything else about the commune. Rumors abound about electric, autonomous new Pods, but we really don’t know. Examples of classic Pods from the ‘70s and ‘80s are incredibly rare, with only two known examples in the outside world: one given to President Carter on a goodwill visit in 1976, one given to famous funnyman Slappy White as a gift, since, for reasons not fully understood, White was incredibly popular in the commune. It’s a fascinating and unique example of automotive evolution, and I really would love to drive one some imaginary day soon. If, somehow this is getting to anyone in the Purismic Commune, please contact us in the rest of the world! We’re all really curious what the hell is going on in there, and things are getting pretty weird out here, anyway.